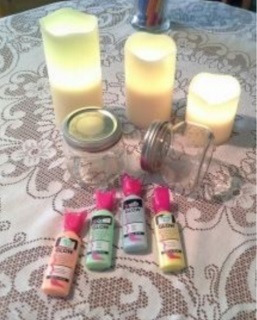 Let Your Light Shine with Glow Jars – LDS Activity Days Ideas! This is based on one of my favorite scriptures. It’s a concept that LDS Primary kids can understand and work on at their level, and it allows for a whole bunch of crafty Activity Days ideas too! Category: Living and Learning the Gospel. Small jar with lid for each girl. I used the short squat ball canning jars. Light table or clamp lamp to quickly charge jars. For the lesson portion, have a battery operated tea light, electric candle or flashlight. Handout with Matthew 5:16 printed on it. There are four graphics you could use from LDS.org if you want to get fancy: Sunny Field, Jesus Christ, Firework, or Lighthouse. Print the handouts with Matthew 5:16 printed on it. Watch this video to get a visual idea of what you’ll be doing. Right before the activity, set out all supplies on table to be ready to use. I placed battery operated color changing candles I had on hand in the center of the table. You can also use other optional light sources. Read Matthew 5:16 to open a discussion on how the girls can let their light shine. Talk about talents they may have and how sharing them is part of letting your light shine. You could also talk about people you may meet and know there is something special about them by the way they shine. While candle or flashlight is on shut the lights out in the room. Remove the candles or flashlight and place it under the table. Ask the girls what just happened and how it feels to be in the dark. Replace the light to center of table and turn light back on. Give each girl a handout to take home. For the activity, place a dollop of each color paint in underside of lid for each girl. Show them how to make dots inside their jars using the paint brush. The brush needs to be dipped again in paint for each dot. The dot should have a peak to it like a candy kiss. Dot the bottom and side of jar using different colors. Do not clean paint from lid; just spread it out. 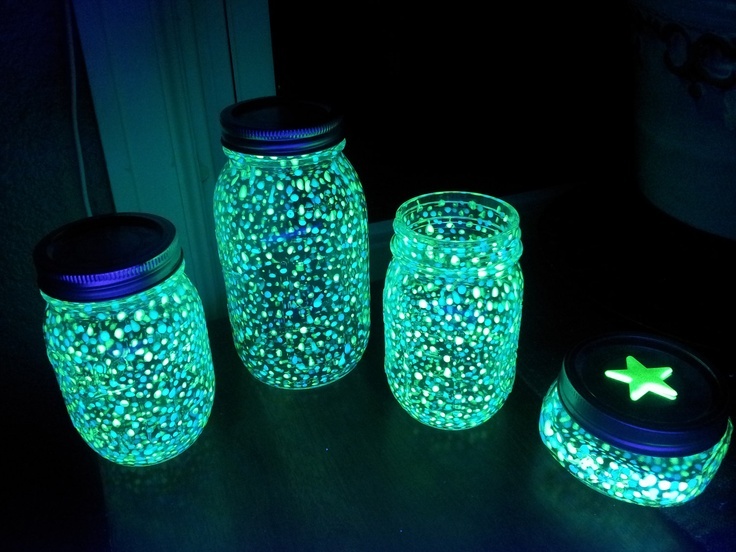 The jar lid will also light up. Place lid on jar. Turn jar upside down and place under strong direct light. While jars are charging. Have a snack. After snack, turn lights out and all the jars will light up. The girls loved the sight of their jars glowing light! Are your kids really into crafts? Find out what type of light switch they have in their room, purchase the appropriate light switch cover (or just buy a variety and return the unused ones to Home Depot when done), and decorate their light switch cover in one of these 19 ways while waiting for the glow jars to charge. This Sharing Time lesson from LDS.org has several ideas to add. An easy word find puzzle about the scripture. Use this Friend article by Thomas S. Monson for more talking points. Share this story about Jesus, maybe act it out if you have the right number of girls. Thanks for sharing. I appreciate all the creative people who share their talents. I can copy, but I struggle coming up with fun ideas. I really rely on generous people like you! Wonderful ideas! I think you mean Matthew 5:16 instead of Nephi 12:16 though. Thanks so much for the heads up! I fixed it. How long do they glow? I did this a while ago so I am not sure. I think the brand and quality of the glow in the dark paint makes a big difference in how long they glow. Did you paint the inside or outside of the jars?